I looked at the must-pack list for the Klondike Gold Rush trail and flinched. My bag was stacked with dungarees, mules, tees, tubes, clutches, belts…There was nothing from TheSkaguay News’ December 31, 1897, ‘What Women Should Carry’ list. I shuddered. I was packing for Dawson City , the 8-street, 1,800-people squat town in Yukon ( Canada ) where gold was discovered on August 16, 1896 . Would I get iced before finding that glittering gold nugget? I was not even carrying the bacon, beans and condensed cream that topped the food list for the gold hunters. Would I get skin-on-bone before sieving through gravel for gold flakes? Starvation and sartorial disaster stared at me, but greed had the gumption to push them away and tempt me with stories of Jim Tweed who, in two hours, dug gold worth $4,284 in El Dorado and Frank Dinsmore who hauled gold worth $24,489 in one day from Bonanza Creek . Imagine how much money all this was in 1897! Greed was relentless, as the last temptation it threw in the tale of the boisterous gold diggers who once pelted a dance girl with so many gold nuggets that she had to leave the stage injured. Imagine how much gold there was in Dawson ! Greed seemed the prefect companion for a gold rush trail, it huddled in a corner of my bag and, together, we flew endless hours to Whitehorse , a squat town that sits coquettishly near Alaska . Even before my bag tumbled down the carousel in the pint-sized airport, Jim Kemshead of Yukon Territory Tourism Board rattled off the trail details: a rail ride on White Pass & Yukon Route (WP&YR), often rated as one of the world’s most scenic rail journeys; a stop at Bennett, once the world’s largest tented city; a road trip to Dawson City, where there is an inn called Bombay Peggy’s; an evening at Diamond Tooth Gerties, Canada’s oldest casino, where women do the cancan and men play poker; gold panning; and a taste of the world’s weirdest cocktail – Sourtoe Cocktail, a cocktail that has a human toe. I baulked at the idea. Whoa! A human toe in the vodka. But I forgave Kemshead, he looked straight out of a spaghetti western, his laughter lines and gimlet eyes so Clint-Eastwoodian, his voice husky with cigarette smoke. At Carcross, stood the train, its engine hissing for the 64-km ride to Skagway, its people crowded outside pink-painted Matthew Watson General Store for muffins and coffee, its church desolate, its hemlocks and columbines swaying mischievously with the breeze, and Reiko Tanaka’s Gold Rush sushi joint anomalous in a cowboy-ish setting. As the train chugged on the route that is rated as a world civil engineering marvel, an honour it shares with Eiffel Tower , Statue of Liberty and the Panama Canal , I was reminded of the Michael J. Heney, the route’s intrepid rail contractor who famously bragged, “Give me enough dynamite and snooze and I’ll build the railroad to Hell”. Hell was Heney’s exaggeration but granite mountains, steep grades, and cliff-hanging turns were no angels on way when the shovel for the narrow gauge rail route was first struck on May 28, 1898 . For 26 months, 35,000 men blasted cliffs, dug tunnels, plowed snow, laid tracks to create “the railway built of gold”. The cost: $ 10 million. The brown train gasped up steep inclines, manoeuvred hairpin bends and chugged past emerald blue lakes, picturesque hills, and red dwellings. I stood by the footboard, pinched myself to believe that it is not a fairyland, but the same world where I live. 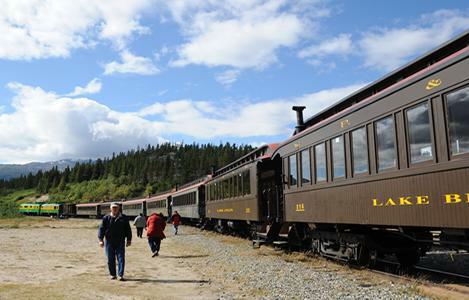 At Bennett, the world’s largest tented city during the Klondike Gold Rush, I knew a bowl of robust miner’s stew was simmering, but I was in no hurry; I was not even complaining of the train’s 15 kms per hour speed. I could have jumped off the train said a prayer in the spooky church of the Ghost Town, threw a bait for the trout, repeated history by digging some gold or ran the length of Steel Bridge, the world’s tallest cantilever bridge. But I was glued to the footboard; I could have bartered gold to gape at the landscape. Scenic is an insincere word for WP&YR, the rail ride is pure ecstasy. Thankfully, unlike the gold stampeders, I did not have to build a raft to reach the gold fields; I slumped into the car seat as Elvis Presley crooned Love me Tender out of a scratchy CD. Dawson City was 525 miles away, but Kemshead pushed the gas pedal so hard that in five hours I was in the 8-street, 1,800-population town where women still wear long skirts, tweed ponchos and flowers in their hats. Fat raindrops were pounding the streets which once reverberated with the onomatopoeic sound of the heavy-soled miners’ boots and the rustle of the tulle gowns of ‘tenderloins’, a mysterious adjective for women who entertained men. There was the Flora Dora Hotel with lace curtains and a provocatively dressed mannequin; the dilapidated façade of the bank where British poet Robert Service worked as a teller; Bombay Peggy’s, a then-notorious pub; Palace Grand Theatre built by a Wild West showman, who hired a vaudeville and a stock theatre company to entertain the grubby miners; and yes, the Diamond Tooth Gerties, where women still dance a quadrille… Everything in Dawson alludes to the epiphany of the gold rush when the city bustled with 20,000 gold hunters. Today, Dawson ’s silence is so deafening that I could even hear my heart pound. Known as Paris of the North, Dawson’s glory lay in its gold; the world’s biggest gold rush lasted barely four years, but even now, gold is Dawson’s reason to be – more than a century after the last gold hunters left, huge Caterpillars are still scrounging the hills and rivers for gold. I decided to try my luck – I had brought greed along and I had to go gold panning. Who knew I could get as lucky as Big Alex McDonald, who, a century ago, had $ 8 million in his coffers. By the creek, I slipped into oversized Wellingtons , picked a sieve, muttered a prayer, walked into the creek, shoved a handful of sand in the sieve. I sifted. I sifted harder. But all I could see was sand. Nothing was glittering. There was no gold dust. I sieved again. And peered harder. All sand. I squinted. Perhaps I was mistaken. Perhaps there were gold flakes. If squinting hard could turn sand into gold, I could have become a millionaire in Dawson . I sifted again. No luck. No gold. Disappointed in Dawson , I retraced my steps. And then! A tiny vial dropped in my lap. There were two gold flakes floating in the vial water. I looked up – Cynthia of Dawson Tourism had found gold. She gave me her gold. I left greed behind in Dawson . I got back home with gold. And Cynthia’s kindness.